Speed your studies with this pre-built Jurkat cell line for monitoring NF-κB signaling in real time. We’ve already integrated an expression cassette that includes NF-κB-responsive transcriptional elements upstream of a minimal CMV promoter (mCMV)-GFP cassette. Expression of GFP (up to 30-fold over background) only occurs in the presence of active NF-κB signaling, enabling screening for genetic and/or small molecule inhibitors and activators of the NF-κB signaling pathway. 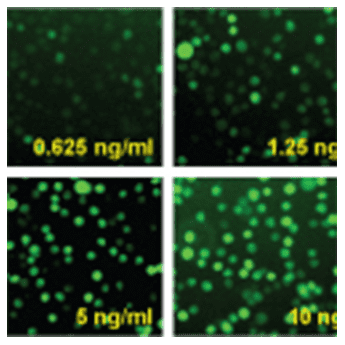 METHODS: NF-B/Jurkat/GFP™ Reporter cells (5×105 cells) were plated at a concentration of 1 million cells/mL into each well of a 24-well plate. TNF-α was added in the amount indicated in the figure. After 24 hours, GFP fluorescence was measured and intensities plotted against TNF-α concentration (A). The fluorescent cells in the original 24-well plate were also photographed on a Zeiss inverted epi-fluorescence microscope (B). Alternatively, 200 μL of cells were fixed with formaldehyde and GFP reporter induction analyzed by flow cytometry, and either the GFP intensities (C) or the percentage of GFP positive cells (D) were plotted against the amount of TNF-α.